You've got an email! These 4 words still hold magic for consumers across the globe. Which is why email as a marketing channel generates the highest ROI ( an estimated ROI of $38 for every $1 spent, according to the Direct Marketing Association). Here we discuss key email marketing insights from 2016 to help you understand how the landscape of email is changing and how marketers are aligning with the changes. 1. 47% of respondents say brand-building is their main goal for email marketing, as per Clutch's Email Marketing Survey 2016. 2. 67% of email marketers select customer acquisition as one of their two top marketing goals for 2017, according to Digital Marketing Industry Forecast by Campaigner. However, compared to 2016, 9.5% fewer marketers chose customer acquisition as a top goal for 2017, while 14 % and 11.4% more selected brand awareness and brand loyalty as a top goal, respectively. 3. The most important goals of an email marketing strategy include increasing engagement rate, increasing customer acquisition, and improving email personalization, as per the Ascend2 “Email Marketing Strategy”. However, the report also found that these goals are also some of the most significant barriers to email marketing success. 4. Top email marketing challenge in 2016 was increasing open rates, which was followed by churning out interesting content and earning new subscribers, as per a report by Campaigner. 5. Targeting & segmenting are the biggest challenges for email marketers, as per the Ascend 2 report. 6. Brands are struggling with data and channel integration, as per the 2016 Marketing Trends Survey by Selligent. 7. Marketers are still struggling to connect with prospects via email as inbox placement rates have witnessed a decline from 2015’s numbers. In the US, the placement rate stood at 80% in Q3 2015, before dropping down to just 69% in Q2 2016, as per the “2016 Deliverability Benchmark Report” from Return Path. 8. Many marketers started using emojis in their subject lines in 2016. And 89% of those using emojis saw an increase in open rates as a result, as per the Campaigner survey. 9. Deceptive subject lines can increase your current open rates. But it can cost you future clicks, open rates and leads. A majority of consumers report having felt opener’s remorse, according to a joint Litmus-Fluent consumer survey. 10. When it comes to A/B testing, subject lines hit the top spot, as per the 2016 State of Email Design. 11. Email had a median ROI of 122%, according to US marketers polled June 2016 by the Data & Marketing Association and Demand Metric. 12. Agency professionals and in-house marketers named email marketing as a channel able to provide a strong ROI, at 80% and 73%, respectively, as per March 2016 polling from Econsultancy. 13. 73% of email marketers rate email marketing as ‘excellent’ or ‘good’ when it comes to ROI, as per the largest UK survey of email marketers by the Econsultancy report. 14. On average, 21% of marketers across all industries said email marketing delivers an excellent ROI, followed by social media coming in second with 15%, as per The State of Email Marketing by Industry 2016. 15. When it comes to receiving marketing offers from brands, customers prefer email. 16. The average proportion of total sales that client-side marketers can attribute to their email marketing channel is 23%. Last year, this average fell at 20%, so the trend is moving upward, as per the Econsultancy report. 17. According to 88% of marketing influencers, email marketing's effectiveness is increasing to some extent, whereas 40% say that the increase in effectiveness is significant, as per the Ascend2 report. 18. The percentage of companies assigning email marketing to a team, as part of wider marketing responsibilities, has increased from 34% in 2015 to 40% this year, as per the Econsultancy report. 19. 68% of companies implement all or a major portion of their email marketing techniques using specialized external resources, as per the Ascend2 report. 20. 46% of respondents cited high frequency of emails from brands as the biggest turn-off, followed by badly-written messages (29%) and offers based on erroneous profile data (22%), as per the Adobe Email Survey 2016 (Europe). 21. 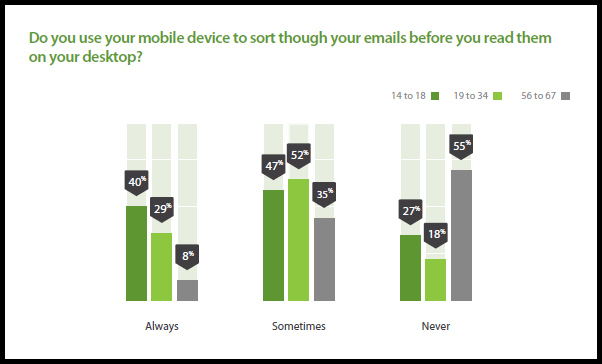 45% of consumers have unsubscribed because the company's email/website didn't work well on their smartphone, as per 2016 Mobile-Friendly Email & Landing Page Trends by Litmus & Fluent. 22. 34% of consumers have marked emails from brands as spam because they didn't work well or display properly on their smartphones, as per the Litmus & Fluent report. 23. Email is the most personalized marketing channel (67%), followed by website (56%), as per a survey by 2016 Trends in Personalization. 24. Individualizing email messages and landing page content are the most difficult personalization tactics to execute, as per the Ascend 2 survey. 25. Email personalization implemented across industries, as per the The State of Email Marketing by Industry 2016. 26. 37% of companies indicate that email personalization practice is now part of their email marketing efforts. That’s a 23% increase from 2015, as per the Email Marketing Industry Census 2016 by Econsultancy. 27. For affiliate marketers, it's lead generation. 28. For agencies, generating leads and improving conversion rates are the greatest benefits. 29. For consultant marketers, it's lead generation. 30. For consumer goods, it's lead generation & improving sales. 31. For education sector, improving sales & generating leads are the greatest benefits. 32. For finance, the benefits are reducing marketing costs and generating more leads. 33. For health & wellness, it's generating more leads. 34. For IT & High Tech, lead generation is the primary benefit. 35. For marketing service providers, the main benefit of email marketing is generating more leads. 36. For online advertising network, it's is the ability to integrate with other media to boost response. 37. For online businesses, it's generating more leads. 38. For publishing & media, it's lead generation. 39. For retail & e-commerce, it''s increasing sales. 40. For travel & transportation, it's improving sales. 41. For vacations, hotels & leisure, it's improving sales. This data is as per the The State of Email Marketing by Industry 2016. 42. 75% of the email marketers said they were using email automation, and 58% cited personalization techniques. 17% of email marketers surveyed said responsive design, and 18% were using advanced segmentation, as per The State of Email Marketing by Industry 2016. 43. 79% of companies surveyed cited basic segmentation & 64% said optimising email for mobile devices, as per the Econsultancy report. 44. 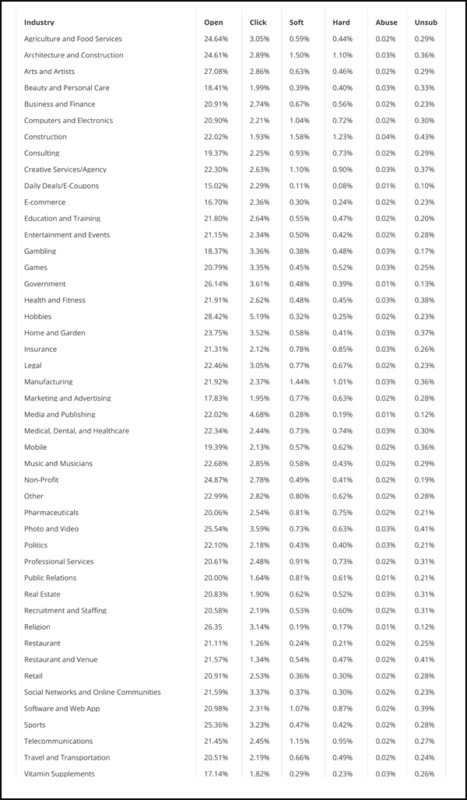 Here's a detailed report by Mailchimp on average unique open rates, average unique click rates, average unique soft bounces plus other insights by industry. 45. Only 23% of marketers have an integration between website and email in place and track what happens after the click, as per the The State of Email Marketing by Industry 2016. 46. Measurement and analytics are the most used services provided by email technology provider, as per the Econsultancy report. "Improvements in service provider technologies have enabled a wider range of content personalisation, beyond simply the name, with enhanced targeting through segmentation increasing the effectiveness of email campaigns. Previously referred to as a ‘dying art’, the application of big data to email, and the ease with which ROI can be proved through its measurability, has meant that email has returned to favour with marketers." the report read. 47. More than 50% of email messages are read on mobile devices, as per 2016 Adestra Consumer Adoption & Usage Study. 48. 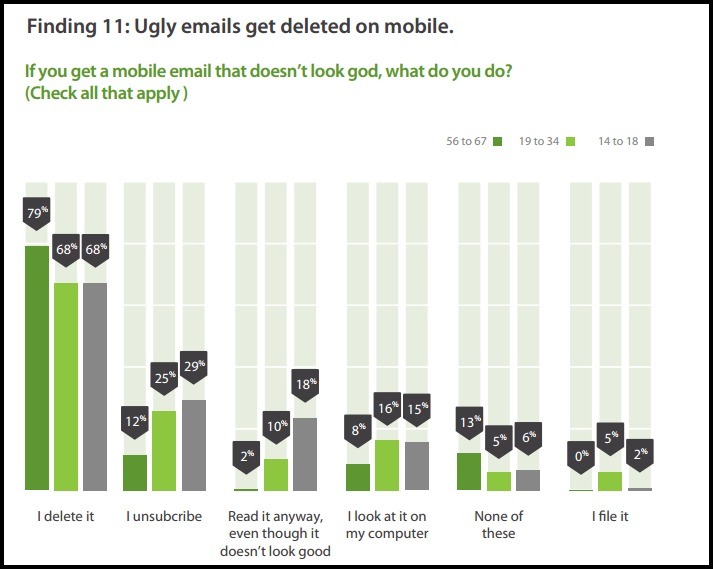 People aren't very forgiving when it comes to ugly emails on their mobile devices, the Adestra study found. 49. 66% of all marketers surveyed in The State Of Email Marketing 2016 have implemented mobile-optimized templates. 50. Mobile can make or break your email, as per 2016 Adestra Consumer Adoption & Usage Study.